This laid-back backpacker pad is known for the sunset views at their water’s-edge communal area and bar, but the dorms aren’t half bad either. When we visited Dragonfly Guesthouse in low season the place was fully booked because so many of their guests had decided to extend their stay — a good sign, we think. Dragonfly offers an inexpensive place to stay just up the hill in M’phey Bei Village. 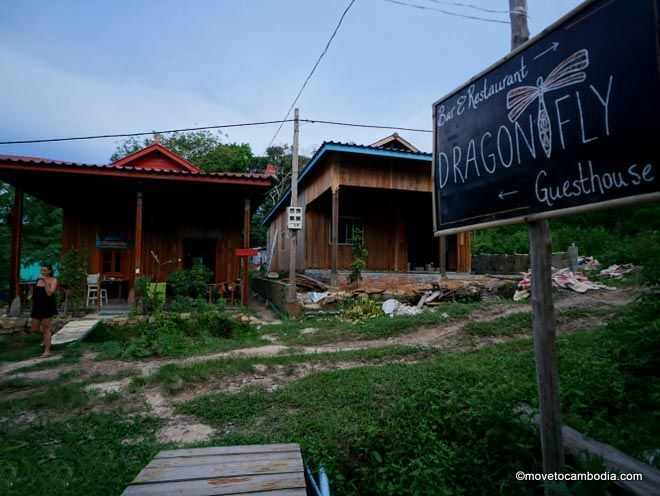 Just up the hill from M’phey Bei Village, Dragonfly Guesthouse is a backpacker favorite. The wooden house has a mixed dorm with nine beds. The dorm beds are upstairs in an attic-like room, but the walls do not extend fully to the ceiling, and the top four feet are open-air wooden crosshatches to allow for ventilation. 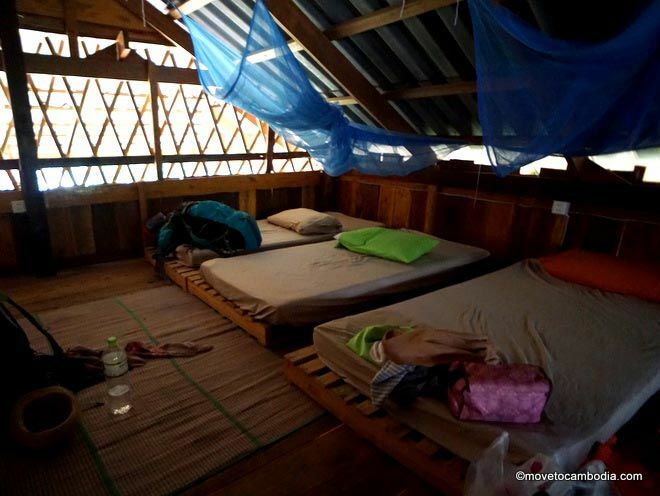 The dorms are quite spare; each bed is little more than a futon on the ground with a mosquito net for protection. Dragonfly also has one private double room with a shared bathroom. This, too, is spartan, offering a futon and mosquito net on a concrete floor. 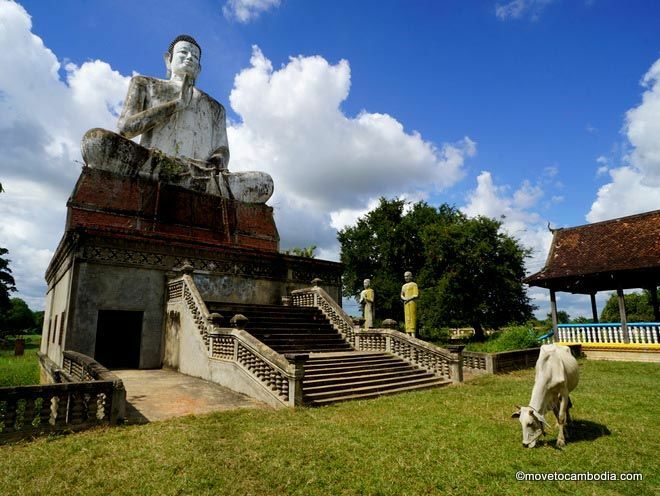 Nevertheless, the place has a pleasantly homey atmosphere, perhaps due to the friendly backpackers working there. The dorms were full when we visited, with guests saying they like it so must they extended their stay. The best part about Dragonfly is the bar and communal area that is just across the lane. 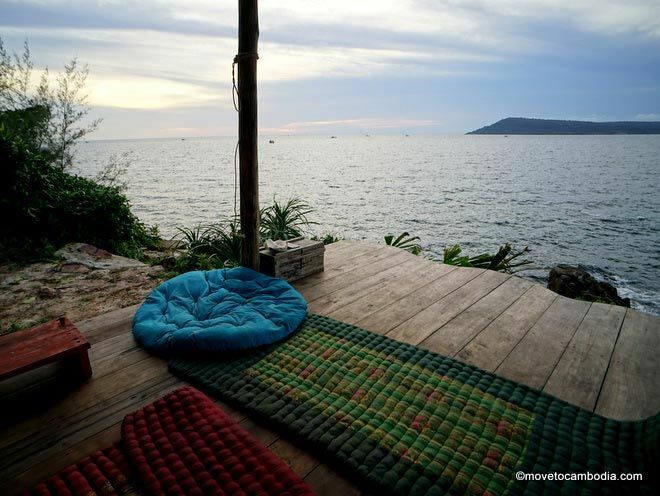 Because Dragonfly is on a hill, they have spectacular views of the bay and Koh Rong in the distance. There’s a wooden platform just over the water’s edge that is the best place in the village to watch the sunset, and during the day it’s used for yoga classes and meditation. The bar serves inexpensive cocktails and the ubiquitous Klang beer, but also red, white, and sparkling wine for those looking to celebrate their beach-bum lifestyle. There’s a limited range of food options, including breakfast, sandwiches, and items meant to be consumed with the aforementioned wine, including a cheese platter and mezze plate. Did someone say sundowner? The view from the Dragonfly bar and restaurant. Electricity is available from 7 a.m. to midnight at Dragonfly. Hammocks are widely available, as is the option to chill out and do nothing. If you need internet access, they suggest that you pick up a 4G SIM card before you arrive. Because they are often fully booked, bookings should be made in advance. → Check prices and book a room at Dragonfly Guesthouse on Booking.com or Hostelworld now. For more information on ferries to M’phey Bei, check out our guide to getting to Koh Rong Sanloem. Looking for more? 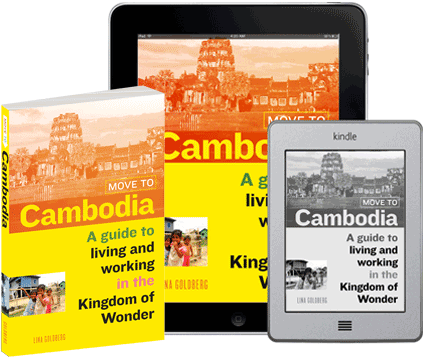 View the full Koh Rong Sanloem guide for tips on how to get there, where to stay, and things to see and do.